A member of the opposition party told Saturday Sun that the PDP considered the meeting strategic to the holding of the zonal rally in the South South zone. The National Caucus of the Peoples Democratic Party (PDP) yesterday met in Port Harcourt, the Rivers State capital to pacify Governor Nyesom Wike not to quit the party’s 2019 Presidential Campaign Council. 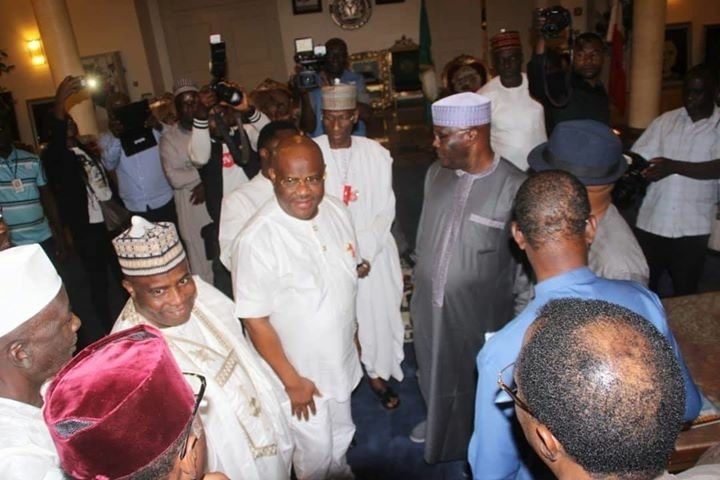 Though it appeared as the usual PDP caucus meeting but the venue was carefully chosen to woo Wike and put pressure on him to rescind his decision to resign as the South South coordinator of the party’s Presidential Campaign Council. A highly placed member of the opposition party told Saturday Sun that the PDP considered the meeting strategic to the holding of the zonal rally of the party in the South South zone. The PDP had earlier held its zonal rallies in North West, North Central and South West. At Press time, those in attendance include the PDP presidential candidate, Atiku Abubakar, Senate President, Bukola Saraki, Speaker, House of Reps, Yakubu Dogara and governors of Rivers, Abia, Cross River, Kwara, Sokoto and Ebonyi. Others include the Deputy Senate President, Ike Ekweremadu, PDP vice presidential candidate, Peter Obi, former governors Ayo Fayose and Liyel Imoke. Also in attendance were the party’s National Chairman Uche Secondus, Senator Ben Murray Bruce, former Deputy Speaker of the House of Representatives, Rt Hon Austin Opara, Senator Olaka Nwogu, Hon Hassan Saleh and several members of the National Assembly. Last Week Saturday Sun reported that Wike’s letter of resignation as Atiku’s campaign coordinator for the South South was ready for submission. Before the commencement of the meeting, Rivers State Governor, Nyesom Ezenwo Wike conducted members of the PDP Presidential Council on a tour of the Rivers State PDP Campaign Office. The office also houses the PDP Presidential Campaign Office in the state. Ahead of the strategic meeting of the PDP Presidential Council at the Rivers State PDP Campaign Office, Governor Wike hosted an expanded meeting of PDP Leaders at the Government House Port Harcourt.